In a medium bowl, mix together butter, poppy seeds, onion, Worcestershire sauce and prepared Dijon-style mustard. Slice rolls in half horizontally and set aside tops. Spread bottoms with the butter mixture. 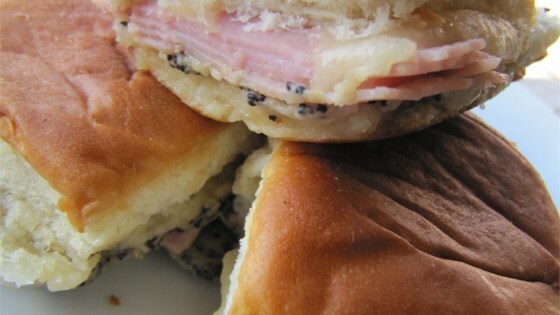 Top with ham and Swiss cheese. Replace tops. Arrange rolls in a single layer in a medium baking dish. Bake in the preheated oven 10 to 12 minutes, until rolls are lightly browned and cheese is melted. I was looking for this recipe, and followed it to the T. The rolls were soaked in grease. I had made them for my parent's 50th anniversary party, and they were eaten, but I was embarrassed!